Dodging lightning bolts and torrential rain, I made it down to Basement Discs on Friday lunchtime for the Hot Club Of Cowtown In Store. It was a beauty - foot tapping western swing played with enormous verve and spirit. 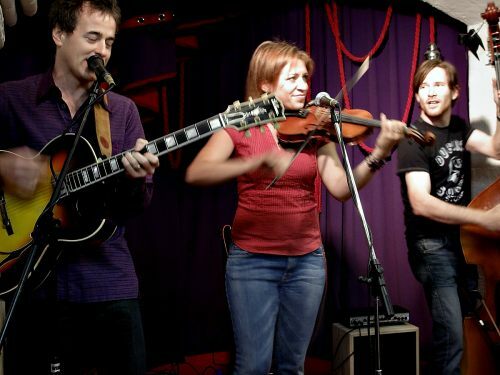 Hot Club Of Cowtown were originally formed in New York in 1996 and after a period of busking and small clubs they moved to Austin in 1997. The band's name is an homage to Django Reinhardt and Stephane Grappelli's The Hot Club of France. They are Bob Dylan's favoured swing band and have been his support band on tour. 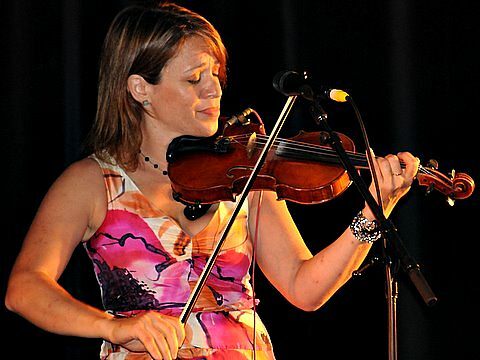 Also Elana James has been Dylan's fiddle player - an unusual choice since he doesn't often share the stage with women. They have a number of CDS to their credit including some by the eponymous Elana James. They re-grouped as The Hot Club of Cowtown in 2008 after a break and are currently completing a new CD which was unfortunately not available at the concert. 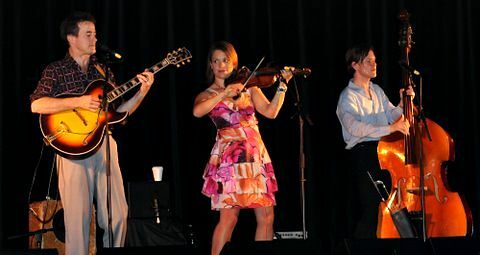 Hot Club of Cowtown is a trio featuring Elana James, masterful violinist and vocalist. The other members of the group are Whit Smith, guitarist and vocalist and Jake Erwin on upright bass and vocals. Together they create a dazzling mix of sound, predominantly old time dance music tunes. There was a good crowd at Basement Discs to see the band and we were lavishly entertained by the swinging rhythms of Hot Club. They generously performed seven songs including Tonight No Light Will Shine on Me, Ida Red, Deed I Do and Sleep. I'm sure they won many new fans with their on-stage charm and mastery of the music. Thornbury Theatre is a new venue for music, but a very old establishment, formerly a picture palace and then a Greek Reception Centre. The only thing it lacks, according to one of the audience who attended, is disabled access. On Friday night a small crowd (for the large venue) was treated to two superb acts. Our very own Dancehall Racketeers warmed the stage for Hot Club and performed a lively set of approximately nine tunes. For the first time in their long history of playing Melbourne's pubs and clubs, the Racketeers performed without a drummer. The band was composed of string instruments, Andy Baylor leading on fiddle and guitar with Rick Dempster on lap steel. It also included Andy Scott on double bass, and a guitarist/banjoist. The Dancehall Racketeers were in fine form and were the perfect support act for Hot Club of Cowtown and drew accolades from the visitors. Among the songs performed was Bob Wills The Waltz You Saved For Me, That's What I Like About The South, Lovesick Blues, Moonlight Waters and Calypso Swing which was a thrilling mix of Swing, Charleston and Hawaiian styles. By the time Hot Club of Cowtown hit the stage the audience (a modest crowd who by no means filled the large venue) were thoroughly warmed up for the main act. Hot Club opened their first set with the slinky sensual vocals of Elana James on Deed I Do. Sounding very like Asleep at the Wheel, they then launched into Down The Line, Elana encouraging the audience to get up and dance. As an incentive, she offered a free CD to the first couple to get up and do so. Dancers were not out in force and were not a patch on those who regularly attend swing sessions. The first set comprised twelve tunes in all, a mix of instrumental with vocals. Whit Smith is a wonderful guitarist, playing his Gibson at a higher register than is normal. He is noted for his arpeggios and clear punctuation. Jake Erwin really rocks it up on his string bass. And the comely Elana James is a whiz with the violin and has a lovely singing voice that reminds one somewhat of Alison Krauss, and is perfect for the type of music she espouses. Included in this set were traditional tunes Girl I Left Behind Me and Ida Red, Bob Dylan cover. Tonight No Light Will Shine On Me and the lovely Sleep. After a short break, the band returned to swing it up some more with tunes like Dev'lish Mary, Oklahoma Rag and Can't Give You Anything But Love closing with an uptempo version of the classic mountain dance tune Cindy. All up it was one fine show of superlative music played by master musicians. Review written by Anne Sydenham from notes by Yvonne Clark.